432 pages | 5 Color Illus. | 53 B/W Illus. Infants and children spend one- to two-thirds of their life asleep. Despite this, very little attention has been paid to understanding both normal sleep and sleep-related abnormalities during child development. There are profound changes in sleep and circadian rhythm during growth and maturation. Sleep is particularly important in children, due to its putative role in consolidating memory and other neurocognitive functions. 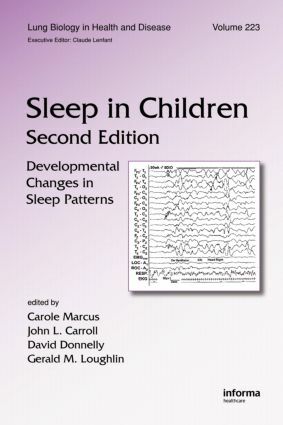 Introduction, Foreword, Preface, Neurophysiological Basis and Behavior of Early Sleep Development. Ontogeny of EEG Sleep. Maturation of Sleep Patterns During Infancy and Childhood. Maturation of Processes Regulating Sleep in Adolescents. Characteristics of Arousal Mechanisms from Sleep in Infants and Children. Thermoregulation During Sleep in Infants. Behavioral Influences on Sleep in Children and Adolescents. Cultural Influences on Infant and Childhood Sleep Biology, and the Science That Studies It: Toward a More Inclusive Paradigm II. Pediatric Parasomnias. Narcolepsy in Childhood. Sleep in Children with Neurologic Disease. Sleep and Psychiatric Disorders in Children. Restless Legs Syndrome and Periodic Limb Movements in Sleep in Children. Gastroesophageal Reflux During Sleep. Assessing Neurobehavioral Outcomes in Childhood Sleep-Disordered Breathing: A Primer for Non-neuropsychologists. Structural and Functional Magnetic Resonance Imaging as a Research Tool in Pediatric Sleep Research. CAROLE L. MARCUS is Professor of Pediatrics at the University of Pennsylvania, and Director of the Sleep Center at Children’s Hospital of Philadelphia. Dr. Marcus received her M.B.B.Ch. from the University of the Witwatersrand, South Africa, and has written over 60 peer-reviewed articles and over 50 books and chapters. JOHN L. CARROLL is Professor and James H. Hamlen II Endowed Chair in Pediatric Pulmonology, Departments of Pediatrics and Physiology, College of Medicine, University of Arkansas for Medical Sciences, Little Rock. Dr. Carroll received his M.D. degree from the University of Texas, Southwestern Medical School, Dallas, Texas, and has written over 50 peer-reviewed articles. DAVID F. DONNELLY is Associate Professor of Research, Department of Pediatrics, Yale University School of Medicine, New Haven, Connecticut. Dr. Donnelly received his Ph.D. from Albany Medical College, and has written more than 70 peer-reviewed articles and six chapters and books. GERALD M. LOUGHLIN is the Nancy C. Paduano Professor and Chairman, Department of Pediatrics, Joan and Sanford I. Weill College of Medicine, Cornell University, and Pediatrician-in-Chief, Phyllis and David Komansky Center for Children’s Health , New York-Presbyterian Hospital/Weill Cornell Medical Center. Dr. Loughlin received his M.D. from the University of Rochester Medical School, New York, and has written over 50 peer-reviewed articles and over 20 books and chapters.